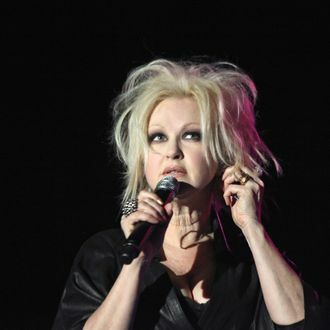 Cyndi Lauper is getting a docu-soap reality show about her life, WE TV announced today. That is a little bit sad just on its own, but hey, everyone’s carrying a heavy burden or whatever. The real travesty here is that the show’s working title is Cyndi. Come on! Cyndi Lauper: She’s So Unusual, Cyndi Lauper: Girls Just Want to Have Fun, Cyndi Lauper: Money Changes Everything? She Bopping with Cyndi Lauper? Cyndi Lauper’s True Colors? Cyndi Lauper: What’s Going On? Cyndi Lauper’s Change of Heart? Deadly Cyns? That’s just off the top of our head. Get with the program, WE TV.